Devoted Quilter: What Do They Really Want? What Do They Really Want? Before I start this week's devotion - did you see my giveaway in this post? There are a lot of voices in this world that we can listen to, many of which are trying to get us to buy something. Many of those voices are subtle and it can sometimes be hard to realize that we're even listening, let alone realize that we're allowing those voices to tell us what to do. King Darius had some not-so-subtle voices telling him what to do, but he still seems to have been rather clueless, both about their motives and their influence over him. The story comes from the book of Daniel, chapter 6. Daniel is a slave in the kingdom of King Darius, where he has been appointed as one of the government leaders. In fact, Daniel is so good at his job that Darius plans to put him in charge of the entire kingdom, which makes his colleagues jealous. These colleagues poke around in Daniel's work, trying to find something (anything!) they can use against him to keep him from getting this promotion, but there's nothing to be found. Daniel is good at his job, plain and simple. He's honest and conscientious, not cutting corners or taking bribes or anything else that could get him in trouble. Since they can't accuse him of incompetence, these jealous colleagues decide to use Daniel's devotion to God (particularly his habit of prayer) against him. "So these administrators and satraps went as a group to the king and said: “May King Darius live forever! The royal administrators, prefects, satraps, advisers and governors have all agreed that the king should issue an edict and enforce the decree that anyone who prays to any god or human being during the next thirty days, except to you, Your Majesty, shall be thrown into the lions’ den. Now, Your Majesty, issue the decree and put it in writing so that it cannot be altered—in accordance with the law of the Medes and Persians, which cannot be repealed" (Daniel 6: 6-8). Talk about trying to flatter your superiors! These guys come to the king and say, "We think you're so great that for the next 30 days all the gods that the people of this nation worship should be replaced by YOU. Let everyone pray to you and only you, because you are so great." And Darius listened to them! I want to jump into the story and shake the man! If he just sat back and thought about this suggestion for a moment, he could maybe see what they were trying to do, but instead, he just "put the decree in writing" (v.9). Really. Well, the jealous colleagues rushed out, caught Daniel when "he went home to his upstairs room where the windows opened toward Jerusalem. Three times a day he got down on his knees and prayed, giving thanks to his God, just as he had done before" (v. 10), and then rushed back to the king to tell him that his law wasn't being obeyed. The king, to his credit, tried everything he could think of to rescue Daniel, but nothing could be done. Come sundown, Daniel was put into the lions' den and the king spent a terrible night worrying, unable to eat or sleep. All of which could have been avoided if he had just considered the motives of the men who suggested the law in the first place. Of course, we'd never act without first stopping to think about the motives behind what we're hearing, would we? Unfortunately, we would. There are believers who live in constant shame because of their past, unable to accept that nothing is beyond the grace of God. They have heard the whispers of our enemy who delights in telling us that our sins are too much for God to forgive. But the Bible tells us, "There is now no condemnation for those who are in Christ Jesus, because through Christ Jesus the law of the Spirit who gives life has set you free from the law of sin and death" (Romans 8:1,2). There are those who believe their worth lies in their physical appearance, believing the voices of beauty companies, who exist only to make money selling their products. And yet we know that God created each one of us specifically and carefully, "For you created my inmost being; you knit me together in my mother’s womb" (Psalm 139:13,14). 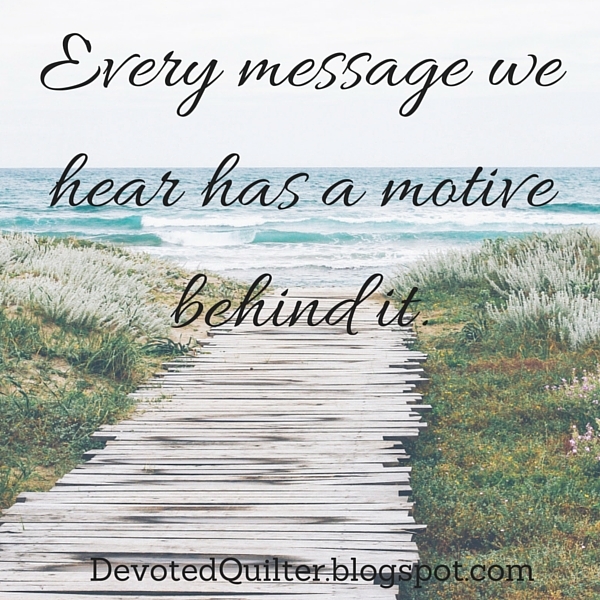 Every message we hear has a motive behind it. It is crucial that we stop to consider what that motive might be before we act on what we hear.